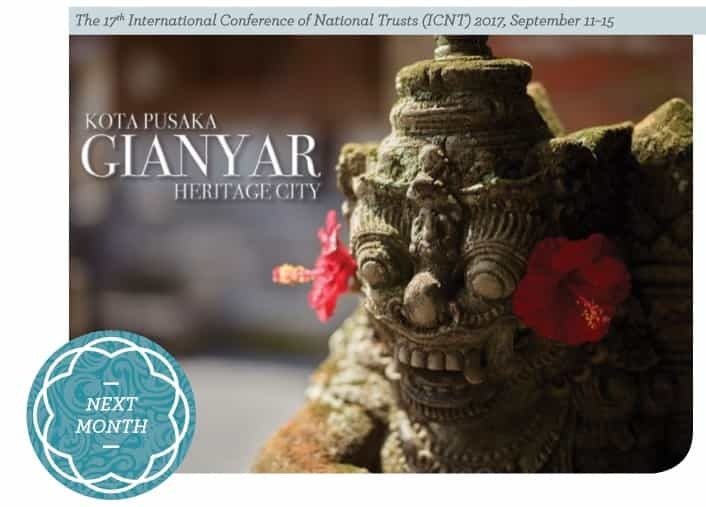 Bali is set to play host to the 17th instalment of a conservation conference involving member countries of the International National Trusts Organisation (INTO) on September 11–15, 2017.
which seeks to explore the relationship between diverse cultures and sustainable development. The conference aims to be a platform for countries to strengthen their support and roles in carrying out conservation eﬀorts. The event is an opportunity to display local traditions and heritage as part of the solution to environmental issues and to highlight many cultural products that could serve as answers to environmental sustainability and climate change. The conference will be held in partnership with the local Gianyar district government in line with Gianyar’s position as one of the Network of Indonesian Heritage Cities (JKPI). Garuda Indonesia, as the national airline, participates in this event to support the promotion of Indonesian culture.